New astro city fluorescent light replacement. Just got my NAC in, and i'm wondering what the exact specs are for a replacement light for next to the speakers. all i know is that it is 15W as read in the manual what are the other specs if there are others. what size also. The screws used to seal up this cart are wood screws. Nobody is going to waste good wood screws on a bootleg, they'd just use cheap electronic screws instead. Re: New astro city fluorescent light replacement. Just go over to a Gamma or similar and buy a 15W 43cm tube. I've installed the light and it isn't working. Is there a switch or something? whats the chance of the fitting being dead? Check if the starter is screwed in tight? I've had that too. It could be that they loosened it to stop the broken bulb from flickering. goatboy wrote: Check if the starter is screwed in tight? I've had that too. It could be that they loosened it to stop the broken bulb from flickering. Where exactly is the starter? Zit aan de TL armatuur naast de travo. Kun je niet missen. Lijkt op een klein lichtje. If that's not it check the wiring. Is there supposed to be something in the fitting next to the trafo? 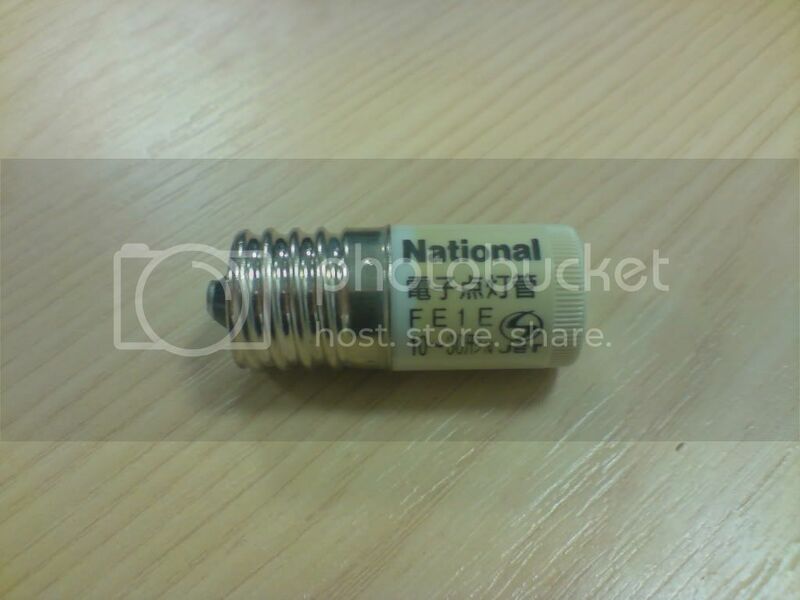 looks like a bulb fitting but it has nothing in it. So the starter missing then. This is one from an Astro. The NAC is similar but hexagonal. that looks exactly like what i need where would i be able to get one. Loads of thanks goatboy, el pancho and CPS2 without i might of gotten a whole new fluorescent light fixture. I've got a spare for a NAC, no good to me since I have an AC. Yours for the price of postage. MP me with your address. Hi, I am new to cabs too and I also got a New Astro recently with a busted light fixture. I haven't actually opened it up yet but does anyone know a site where the parts are relatively easily available? bitkid wrote: Hi, I am new to cabs too and I also got a New Astro recently with a busted light fixture. I haven't actually opened it up yet but does anyone know a site where the parts are relatively easily available? Thanks guys. I don't mind just building a new assembly if that is what I would need to do. I don't really need to find original parts since I'm just interested in playing on it and having fun, not restoring it at this moment (maybe later). I fixed this in the end with a replacement tube from a DIY and a new fitting for the starter plus the right starter, works like a charm.